Red Monkey Coffee UK - Grinders Burr Mill Coffee Bean Grinders, Hand Grinders, Electric Coffee Grinders. A great range of grinders - Burr Coffee Beans Grinder, La Cafatieres Metropolitan Hand Grinder and Gaggias MM Burr Coffee Mill. About Grinders: Ground coffee starts to loose its freshness as soon as the packet is opened. Thereafter the taste goes down over time. Freezer or airtight storage only prolongs the flavour in a limited time. However non ground whole coffee beans will stay fresh for weeks/months before they begin to lose their optimum freshness and beans will only gradually loose their flavour. Cheaply available coffee-chopper blade grinders cut the bean up repeatedly and the friction can often begin to "cook" the coffee whilst grinding. They are also unable to produce an even or fine grind which is required for making espresso, however we do sell a good version of this type for people on a budget, they are great for cafetiere coffee and will work with filter machines but burr grinder is recommended. A common problem for people making espresso is they can't grind the coffee fine enough to tamp and pack into the filter holder resulting in no crema or the shot running through too quickly. A burr grinder uniformly crushes the beans between two mills giving you a powder grind if required. Click to see all colours & order. This is a quality grinder, colours to match the Dream range from Innova, the conical burrs produce a even and consistent grind. Conical burr grinder with easy-to-operate mechanism for changing the grind setting. Clever dosser mechanism: grinds directly into your filter holder, so you always grind exactly the right amount. Metal body and removable bean hopper. Available in 8 Finishes: Polished Aluminium, Red Monkey Red, Kid Blue, Baby Pink, Mandarin Orange, Mediterranean Blue, Night Black & White. Prices include FREE UK Delivery by 24 Hour or 48 Hour Courier. Orders are normally dispatched within 24 hours of ordering, if you specifically require it by a certain date let us know on the order page in the 'latest delivery date' box. 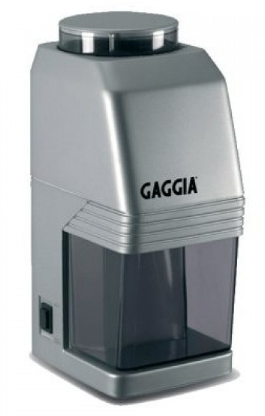 The Gaggia MDF Grinder is a semi - commercial grade burr grinder equal to those found in Europe's espresso bars and restaurants. Precision-machined grinding burrs can be easily adjusted for 39 different degrees of fineness. Automatic dosing allows a pre measured amount of ground coffee to drop directly into the filter holder. Pull lever once for one cup espresso, or twice for 2 cups. Easy to use for perfect results each time. Dosser is designed for use with Gaggia Filter holders. The grinding of the beans is a critical moment in the preparation of a cup of true espresso. Ideally, it should be done just prior to the brewing of the coffee itself, and must be conducted with maximum uniformity and precision. For this the coffee grinder is essential: one has to be able to count on the accuracy of grind in relation to the particular coffee blend. The Gaggia Macinacaffe MM is more than capable of meeting such requirements. In addition, it is elegant in appearance and easy to maintain, and combines perfectly with all of the Gaggia coffee machines.